ATHENS, Ga. –Athens-Clarke County Leisure Services recently added signs to mark the trails of the State Botanical Gardens. The signs, which each include a map of the trails and a list of safety tips, will help ensure the safety of those who hike at the garden. Barbra Anderson drives all the way from Decatur to hike the garden’s trails. She says the signs are a big help. The information on the signs will allow hikers like Anderson and her husband Bruce to indicate their location to search teams and stay calm in case an emergency arises on the trails. 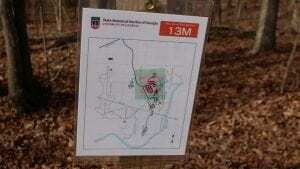 In addition to their emergency uses, the new signs are a tool to help hikers and runners efficiently navigate the State Botanical Garden’s seven trails. For more information about the State Botanical Gardens and the new signs, visit: www.botgarden.uga.edu.